The Farming Systems Trial (FST) at Rodale Institute is America’s longest running side-by-side comparison of organic and conventional agriculture. FST was established in 1981 by J.I. Rodale. During its 35 years existence, FST continues to demonstrate, through scientific research data, that organic farming is superior to conventional farming with regard to building the health of the soil. Over the years, FST has demonstrated the potential of organic farming practices by measuring soil organic matter (SOM), yields, profits, energy inputs, and greenhouse gas emissions. More recently, a study has been established to determine the nutritive quality of grains from this trial. In 2014, FST plots were all planted to oats to reset the trial and update the upcoming rotations to reflect current agricultural trends. Planting all 72 plots to one crop provided an ideal opportunity to compare nutrient quality amongst all three cropping systems being tested at the FST (manure organic, legume organic, and conventional). Over the 35 year history of FST, we have seen visual plant nutrient differences of how organic crops differ from conventional crops. This ultimately led us to wonder if observed differences in plant performance were an indication of nutrient differences in the crops as well. Figure 1. Comparison of organic and conventional corn during the 1995 drought. 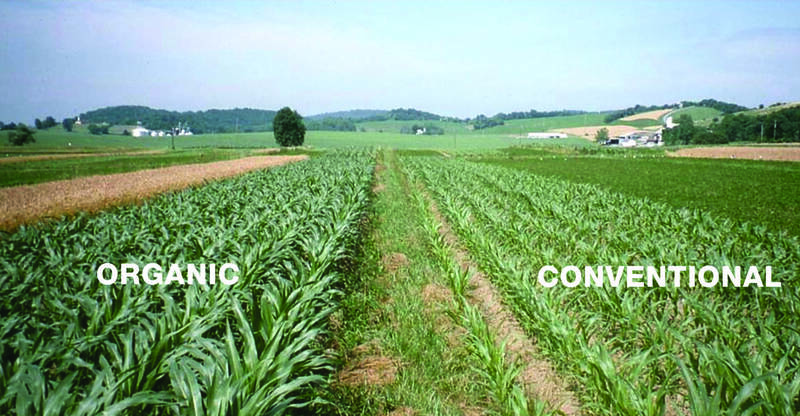 Organic corn pictured on the left was planted 3 weeks after its conventional counterpart on the right. Figure 2. 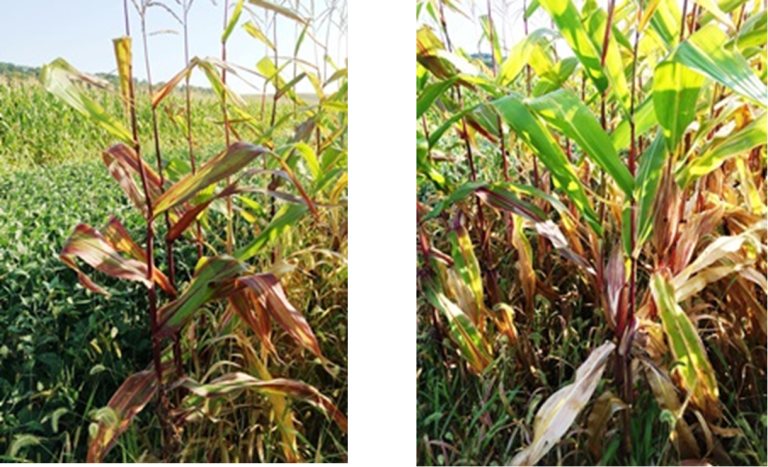 Left – corn in tilled organic legume system; and right corn in tilled conventional system – both taken on 9/15/2015 (Omondi, 2016). Figure 3. Conventional corn from Figure 3 above with ears and leaves showing signs of phosphorus and nitrogen deficiency (Omondi, 2016). Approximately five percent of all food sold in the U.S. is organic, which equates to $43.3 billion in sales as of 2015. As organic food sales continue to grow annually, it begs to question are consumers spending more for a nutritionally superior product? According to our current data, the answer is YES! This project analyzed soil minerals, SOM, soil percent C and N, oat minerals, oat protein and oat percent C and N. Results from the data collected and analyzed revealed that legume organic oats contained higher concentrations of nitrogen and protein (Figure 4 and 5). 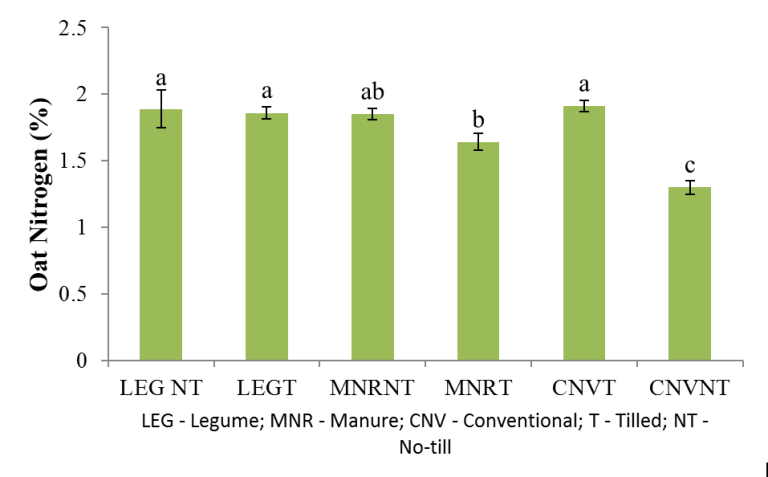 Those nutrients were comparable to those in tilled conventional system but significantly greater than no-till conventional system. Additionally, the concentrations of key minerals such as zinc, iron, calcium, potassium, phosphorous, molybdenum, and copper were found to be highest in the organic manure tilled plots (Table 1). Figure 4. Percent oat nitrogen as affected by the combined effects of cropping systems and tillage methods. Means within a bar followed by the same letter are not significantly different (LSD; α = 0.05) (Wagner et al., 2016). Figure 5. Crude and total protein in oat seed as affected by the combined effects of cropping systems and tillage methods. Means within a bar followed by the same letter are not significantly different (LSD; α = 0.05) (Wagner et al., 2016). Results reported in this article are from a representative sample of 24 plots out of a total of 72 plots at the FST. It is expected that differences between treatments will be more pronounced from a larger sample size when data from the remaining 48 plots are analyzed. Even with this relatively small sample size, this study has shown that nutrient density of organic systems is either comparable or greater than the conventional system. Moving forward, this data will be applied to other projects at the Rodale Institute, such as the new Vegetable Systems Trial (VST), to demonstrate that there are nutrient differences between organic and conventionally grown crops. The next phase of this project will also analyze if pesticide concentrations affects the nutrient quality. Omondi E. 2016. 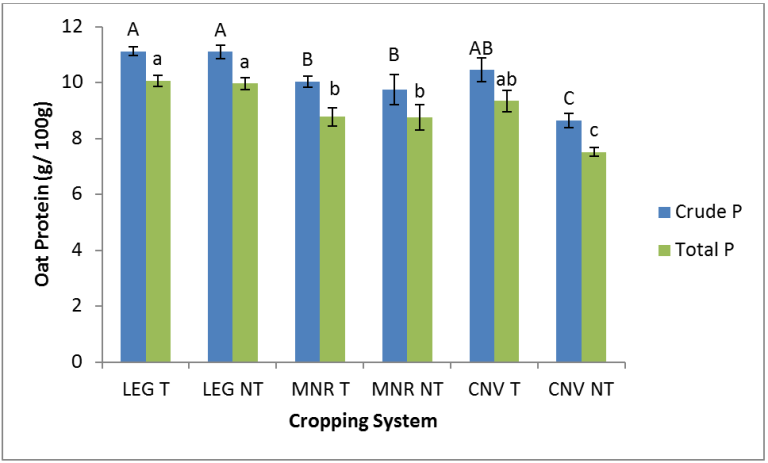 Crop performance between organic and conventional systems in the Farming Systems Trial. Rodale Institute New Farm. Rodale Institute. 2011. The Farming Systems Trial: Celebrating 30 Years.